// on the Riffle, pin 9 is connected to an on-board LED. Using the commands pinMode and digitalWrite, make a sketch and build a circuit that lights up an external LED. Look at arduino help, documentation, and other riffle sketches for examples. (For instance, how do you turn on the 3V3 pin? It may not be how you'd expect). 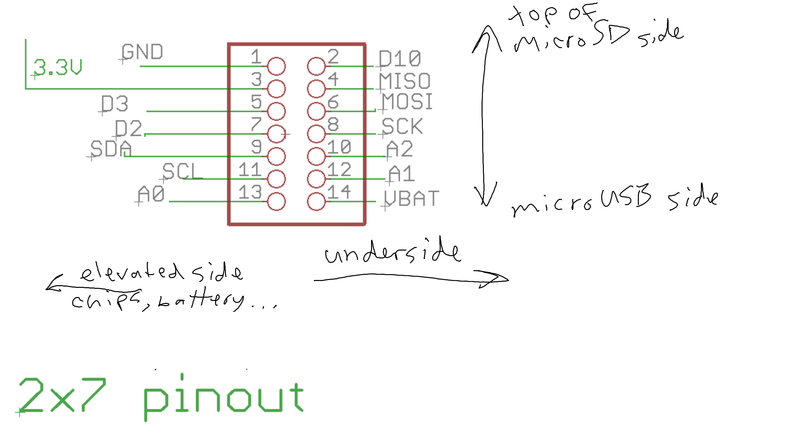 The Riffle's Pinout Diagram may be helpful: EDIT Take this as a reference, with a grain of salt, and rely on example code for how to use it. To orient yourself, odd numbered pins are on the elevated row, even numbered pins are on the lower row. Pins 1 and 2 are the top-side of the board (where the SD card enters). Pins 13 and 14 are at the bottom side of the board (the side that's labeled publiclab.org/riffle, and the side the microUSB plugs in on). Basic safety considerations: do this at your own risk. Shorting out the riffle (having 3V3 voltage go directly into another pin for example) may break it. High current may burn out your LED. Use a resistor in series with the LED to lower the current. A good ballpark resistor value might be 460 Ohms. But try it for yourself: start with higher resistances and move to lower ones. If you need help, post research notes with what you've done so far, use the "ask a question" feature of the public lab website, or ask on the discussion lists. Replicate this activity, post the code that worked for you, and pictures of your experimental setup. This is designed to help folks learn how to build a new circuit and write a new sketch. It uses materials that should be easy to obtain from electronics hobbyist stores, and may be already on hand. Similar tutorials are available for Arduino, however things are slightly different with the Riffle_368, so this activity may help the Arduino hobbyist learn about those differences. This activity is part 3 of a series of research notes exploring the riffle and arduino documentation for the first time, which can be looked at here. To learn how to write and edit activities. If you have ideas about what would make this activity better, please share them in the comments below!